The Chariot turns time wasted getting places by foot into time well-spent on tasks at-hand. 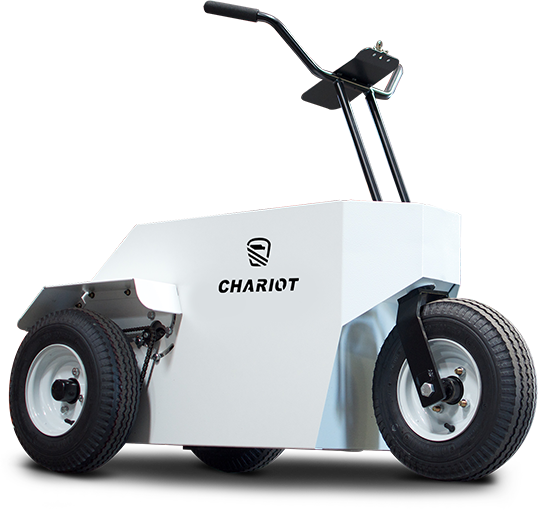 With pure electric power and an overall width that fits through most standard doorways, the Chariot will take you everywhere you need to go, quickly. This transport moves three times faster than average walking speed, enabling you to cover more ground in less time. A low center of gravity and better visibility with stand-up operation makes the Chariot is the safest way to move around virtually any indoor or outdoor space. Schedule a local demonstration using the form below or contact our team to learn more about the Chariot. Features, options, specifications, color availability, and model designation are subject to change without notice. Some vehicles are pictured with options that may be available at extra cost or may not be available on some models. Ask your dealer about the availability of options and verify that the vehicle you order includes the equipment you require. Range will vary depending upon load, temperature, terrain, driving style, and battery pack selected.